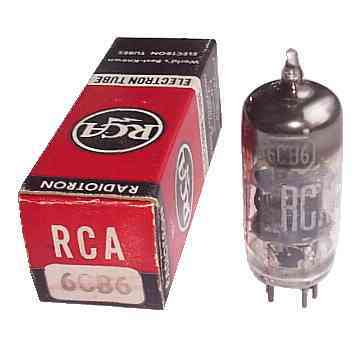 This is an original RCA Radiotron 6CB6 Sharp Cutoff Pentode electronic tube in its original box. Miniature type used as RF or IF amplifier up to 45 MHz in many television receivers. Excellent for replacement, antique radio, instrument, TV television restoration projects, experimentation, circuit research or to set up a private vacuum tube museum. It is a NOS tube - New Old Stock, unused, boxed, in excellent condition.